This is the Hastings 750 Gallon Poly/Plastic Containment Tank. This rectangular 750 gallon poly tank is specifically designed for use as secondary containment. Measures 7' x 8' x 28". Can also be used as a standard poly stock tank. 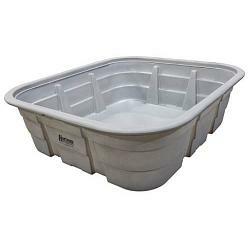 As EPA regulations and SPCC requirements tighten, many people in agricultural, industrial and automotive applications have transitioned to using our standard stock tanks as low cost, small scale secondary containment. In August of 2013, we launched a new rectangular 750 gallon poly tank specifically for use as secondary containment due to many requests we had been receiving. This containment measures 7' x 8' 28" and has been incredibly popular in containment applications for 500 gallon storage systems. This unit also ships with a set of cross braces for use as a standard poly stock tank or in aquaponics systems. This containment tank also contains a drain with drain plug. Hastings Equity Manufacturing offers a 1-year warranty on the plastic/poly containment tanks.